This new musical from the pen of Robert J Sherman may be set resolutely in a bygone era but it’s anything but stale or outdated. Love Birds of 1923 is an avian vaudeville run by Armitage Shanks, a plesiosaur, determined to keep his show clean in a constantly evolving market. When Baalthazar – The Feathered Caruso – walks out due to shoddy audience behaviour, Shanks needs to find another headline act or he’s ruined. Fortunately, four extremely familiar penguins arrive and neither Shanks nor his trio of singing parrots will ever be the same again. From the same team that devised A Spoonful Of Sherman at the St James last year, Love Birds has all the magic and invention that you’d hope to see from the Sherman dynasty, plus a few contemporary surprises too. Its classic backstage story is given a colourful, anthropomorphic interpretation that will undoubtedly appeal to kids as much as the catchy original score will have musical theatre buffs beaming from ear to ear. 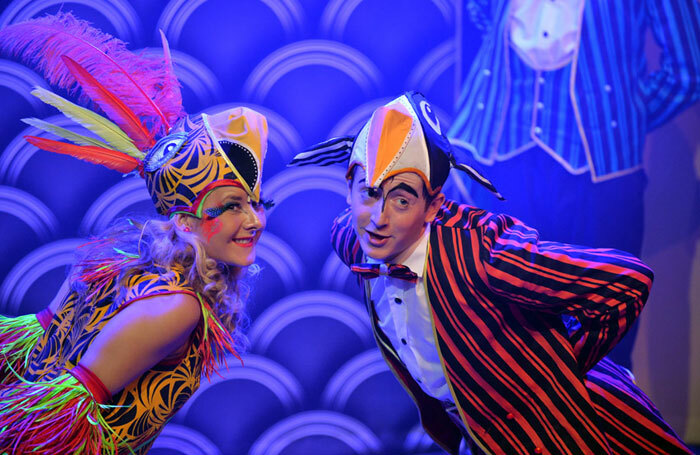 Stewart Nicholls’ polished production boasts a gloriously quirky design from Gabriella Slade and an exceptionally talented cast including Ruth Betteridge and George Knapper as the star-crossed love birds and Greg Castiglioni, evidently relishing his role as a narcissistic, operatic macaw with a cracker habit.